These Easter Dinner recipes include main dishes, sides, and desserts. Below there are recipes for ham, pork loin, lamb, and more for your main courses. These beautiful centerpieces offer flavors of honey, brown sugar, maple, honey mustard, and garlic and herb spices. There’s a wide variety of delicious appetizers and sides as well. From classic deviled eggs to creamy potatoes, there’s a side for everyone at your table! Everyone looks forward to dessert, even after your guests get their bellies full of a delicious homecooked meal. These desserts are sure to please family and friends! 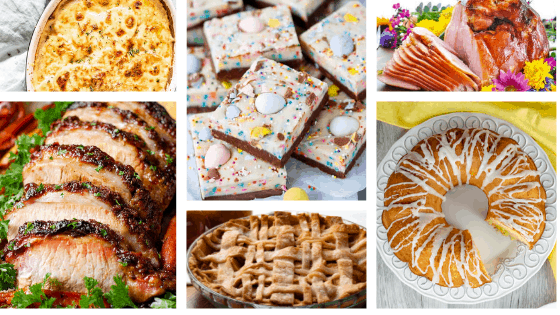 From Easter-themed candies, fudge, and brownies, to moist cake loaves, cheesecakes, and pies, there’s a dessert that your guests are sure to love! These ham, pork loin, roast beef, and lamb recipes make beautiful and delicious centerpieces for your Easter spread. This brown sugar Dijon mustard glazed pork loin with carrots, apples and sweet potatoes is an excellent choice for a Sunday dinner or a holiday meal. Carrots and potatoes are caramelized in brown sugar and so is the top of the roast, generously coated with Dijon mustard and dark brown sugar. A stunning meat centerpiece of any dinner would be this Honey Mustard Glazed Roasted Rack of Pork. Brined in apple cider with plenty of aromatics, slow roasted and glazed, and perfectly frenched rib bones make this pork rib roast taste as good as it looks! EASY 4-Ingredient Ham is perfect for any celebration and is so hands off, it could even be made for Sunday Supper with leftovers to get you through the week! Brown Sugar Ham Glaze - Better than Honeybaked Ham! My Brown Sugar Ham Glaze is perfect for the holidays, is quick to make and will transform your store bought ham into something really special! These appetizers and sides include vegetables, bread, pasta, and soups. Nothing says comfort food better than a big old helping of homemade Scalloped Potatoes (Dauphinoise Potatoes). Easy and delicious roasted radishes recipe! These spring veggies are oven braised in honey butter, then topped with lemon zest and fresh thyme. The perfect spring vegetarian side dish! Ham and Cheddar Pasta made with ham, onions, farfalle, cheddar cheese, and spices made in the pressure cooker. Mashed potatoes made with sour cream, cream cheese, chives and are seasoned with paprika. Baked in the oven for the perfect mashed potato recipe for your dinner. Honey Balsamic Roasted Carrots offer a healthy side dish to your next holiday meal or weeknight dinner. The sweet honey mixed with the robust flavors of balsamic vinegar and olive oil pair wonderfully to add flavor to this roasted carrots recipe. This classic and easy deviled egg recipe is great potlucks, parties, and holiday dinners. This copycat recipe for Timberwood Grill is made with cornbread mix and cake mix to create a smooth texture and a sweet flavor. Learn the simple steps to make the best yeast rolls. These honey yeast rolls are soft, light and airy. This is the only dinner rolls recipe you need! These Moroccan Carrots are spiced just right. The perfect side dish for every day or for special occasion. Kid-friendly too! An Italian Loaded Mashed Potato Casserole is a perfect side dish for a comfort food dinner. Filled with smoked provolone and salami, topped with breadcrumbs for a crunchy top, this is will be a new family favorite. Corn and Pepper Soup is perfect for Spring and Summer. Filled with delicious sweet peppers and super sweet corn, this soup is a perfect addition to meals. From Easter themed to simply delicious, these desserts will look great on your Easter table! Homemade Chocolate Eggs stuffed with Cheesecake! You'll LOVE my Homemade Chocolate Eggs stuffed with Cheesecake, they are rich, delicious and a real no bake Easter treat! Peach Sour Cream Pound Cake with a vanilla glaze. This easy Easter dessert recipe is made with 2 kinds of chocolate, and bunny rabbit peeps, toasted up into an ooey gooey s’mores dip. Spring Carrot Patch Brownies are a chocolatey, ooey-gooey, Oreo crumble-covered, Spring treat. These cute garden brownes are perfect to make for dessert on Easter, or for any Spring gathering. Cheesecake made in the Instant Pot and topped with freshly sliced raspberries. Green Healthy Cooking's beautiful and elegant recipe for dairy free pineapple coconut tartlets topped with edible pineapple "flowers." An amazing dessert! A creamy and flavorful key lime cheesecake made in the Instant Pot and topped with homemade whipped cream. This Easy Easter Fudge has two luscious layers of chocolate mixed with sprinkles and topped with Cadbury mini eggs. A fun Easter dessert that's easy to customize and fun to make! This made from scratch sour cream coffee cake is made with a flavorful cinnamon filling and topped with buttery and cinnamon goodness. A traditional, authentic Italian Easter lightly sweet treat that the family will love. Great for children to help make. These are the most moist and delicious homemade carrot cake cupcakes ever. Each cupcake is filled with shredded carrots, crushed pineapples, and coconut flakes. So much goodness. This homemade apple pie is a favorite in our home and is perfect for Easter, Thanksgiving, and Christmas. A creamy lemon filling baked into a graham cracker crust and topped with some fresh whipped cream make this Lemon Icebox Pie is one of the best summer pies you’ll ever make! Blueberry hand pies using simple ingredients - so easy that the kids can help!